When it comes to baking tasty treats, nothing is more important then the ingredients. In my opinion, cooking is all about the ingredients. One common ingredient in baked goods is vanilla extract. 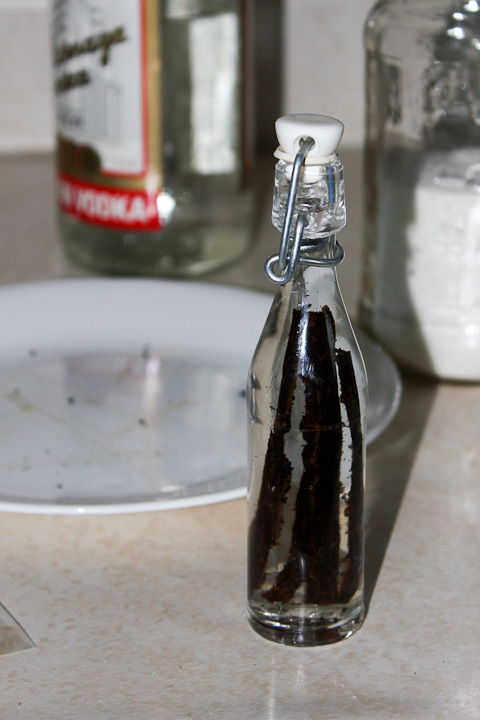 Nothing is better then natural vanilla extract, and in fact it is quite easy to make yourself. 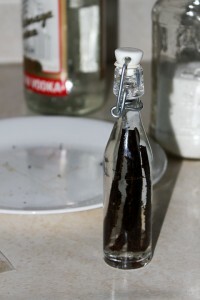 I have been making my own vanilla extract for many years now. It started when I noticed the contents list on a bottle of store bought vanilla extract and saw things I was not happy to see there. 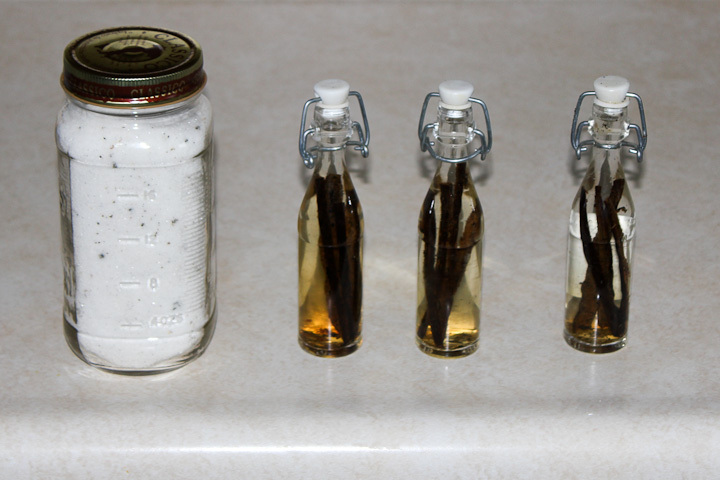 Originally I only made natural vanilla extract, but a couple of years back I started using the inner vanilla beans to make vanilla sugar along with the liquid vanilla extract. Vanilla sugar is excellent for baking, or it can be used directly in coffee and tea to impart a wonderful flavor to your favorite hot beverage. If you are at a loss for a Christmas gift, make a batch of this vanilla sugar and package it up in small jars. It makes a good gift for a coffee lover. 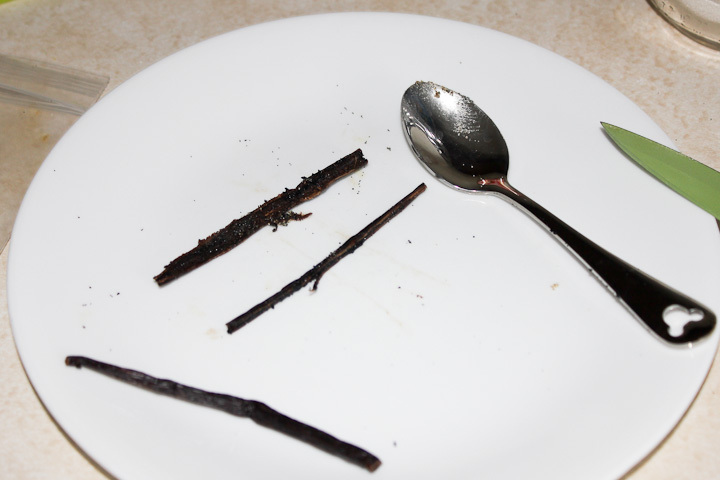 As promised in my early post about 3d Cakes and some 3D cake baking tips, this post will detail how to make your own vanilla extract from natural vanilla beans. 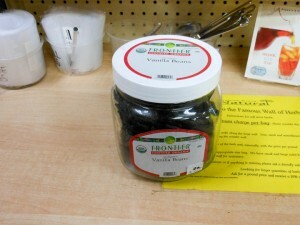 First you must acquire some vanilla beans at a local spice shop. 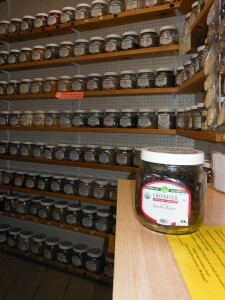 I buy a lot of my spices from a local shop called Granite State Natural Foods in Concord, NH. 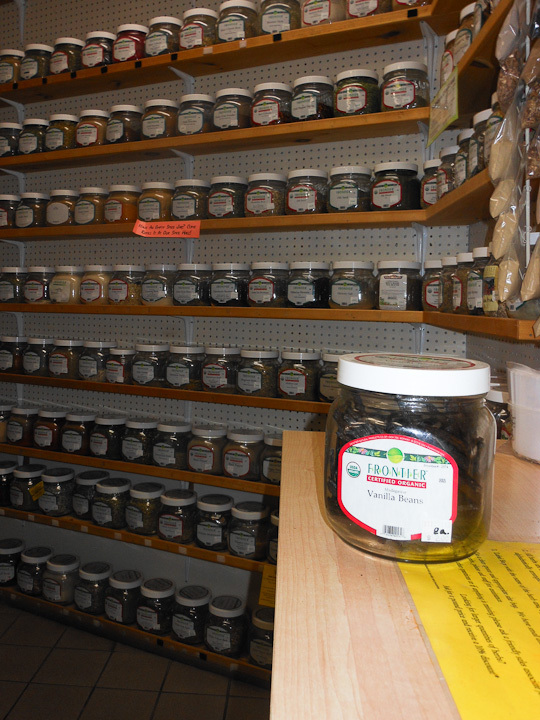 They have a fair selection of spices, flavors, and such available in addition to organic and natural foods. Granite State Natural Foods is the best place I’ve found north of Christinas in Cambridge for hard to find ingredients. 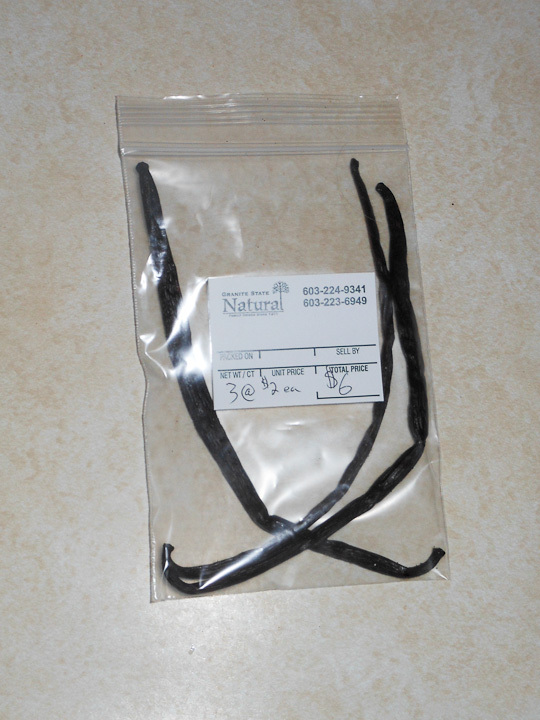 Madagascar Vanilla Beans are sold individually at Granite State Natural Foods. 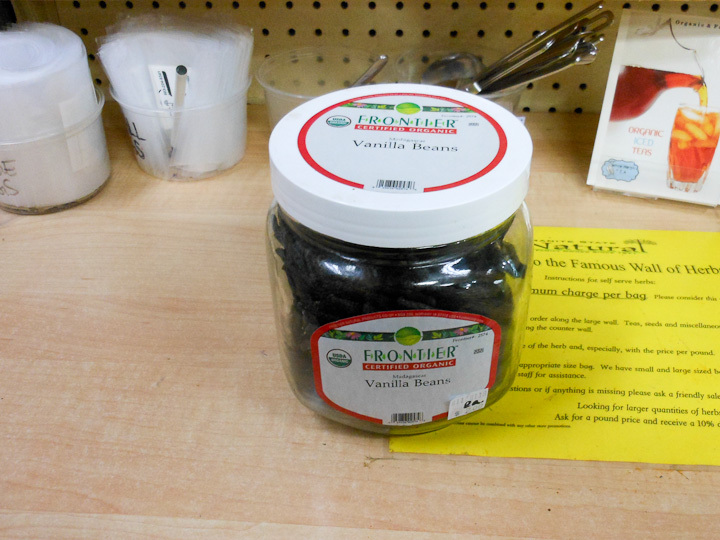 Generally I buy 2-3 beans when I make up a new batch of vanilla extract and vanilla sugar. Selecting vanilla beans does not seem to be an exact science. I try to select fatter more plump beans. As you will see in a bit, I use the inner small black seed-like part of the bean to make vanilla sugar. A fatter more plump vanilla bean seems to have more of these inner vanilla beans. They are also easier to cut up and handle. 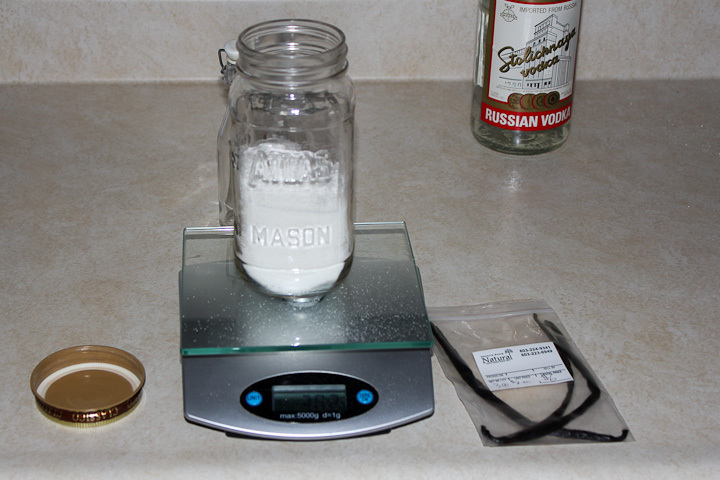 After you have bought some vanilla beans, gather the rest of your ingredients (vodka and sugar) along with some small glass containers. Do not use plastic for storing extracts, spices, or ingredients. Plastic lets the flavor molecules pass through via diffusion over time. This results in less flavorful ingredients, which in turn results in less tasty snacks. 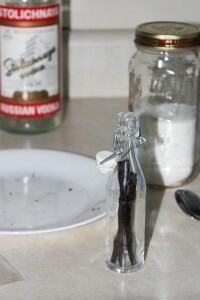 I use the small glass bottles you see above for my vanilla extract. For my vanilla infused sugar I use an old spaghetti jar. I like to save and reuse as much as I can in life, and old glass jars/bottles are perfect for many things in the kitchen. 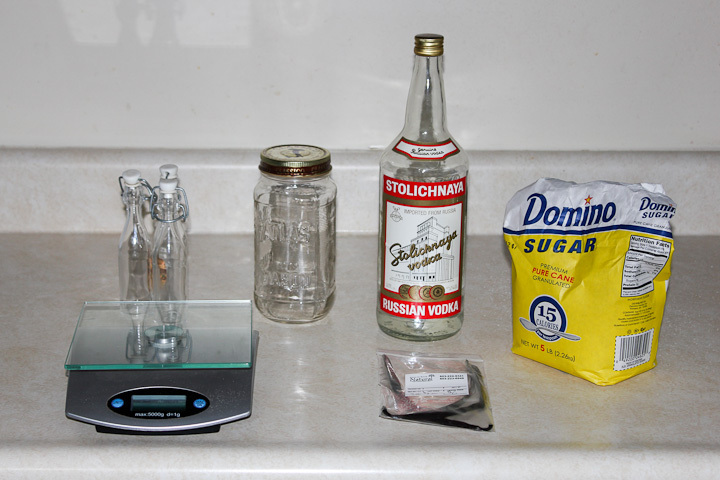 For vanilla extract, I use 1 cut and cleaned bean into ~1.75 oz of vodka. My ratio for infusing Vanilla Sugar is 1 vanilla bean insides to 200g of refined pure cane sugar. I like to weigh out half the sugar to start, then add the remainder at the end. I find it’s easier to mix the small inner beans into the sugar this way. It is a little hard to see, but I first cut the two ends of the vanilla bean off. I then half the bean lengthwise to make it easier to split the bean. Slicing with a sharp knife, cut the bean lengthwise. This exposes the black inner beans. I use a small spoon to scrape this inner bean into the vanilla sugar. If they stick to your spoon just dip it into the sugar and the beans will stay with the sugar. When done cutting and scraping the inner beans out of your vanilla beans, add the other half of the sugar, cap your jar, and shake like mad. Sometimes larger clumps of inner bean needs to be mashed into the sugar with a spoon against the side of the glass jar to help it mix. I find that the vanilla sugar needs at least a month to sit in order to let the flavors mingle and infuse into the sugar. After quartering and scraping the inner vanilla bean into the sugar, I put the vanilla bean husks(for lack of a better name) into my small liquid extract bottles. Then fill with vodka, cap, and let sit on a shelf for at least a week before using. The longer the vanilla extract sits with the vanilla bean inside the better the flavor. I do not filter out the bean solids from my extract, but you are welcome to do so if you feel the need. Careful decanting from my bottles allows me to separate the liquid from solid when cooking. The finished natural vanilla sugar and vanilla extract are delicious. Well, they will be with a little bit of time in the spice cabinet. You can already see the vodka darken as it starts to pull the natural vanilla flavor from the beans in the above photo where the first bottle I filled is the left most bottle. By making your own vanilla extract you can be sure it contains nothing “extra” such as glycerin, glycols, or corn syrup found in some commercial vanilla extracts. With valentines day approaching I will be doing some treat making for my favorite little ones. Perhaps, I’ll share that in a future post. 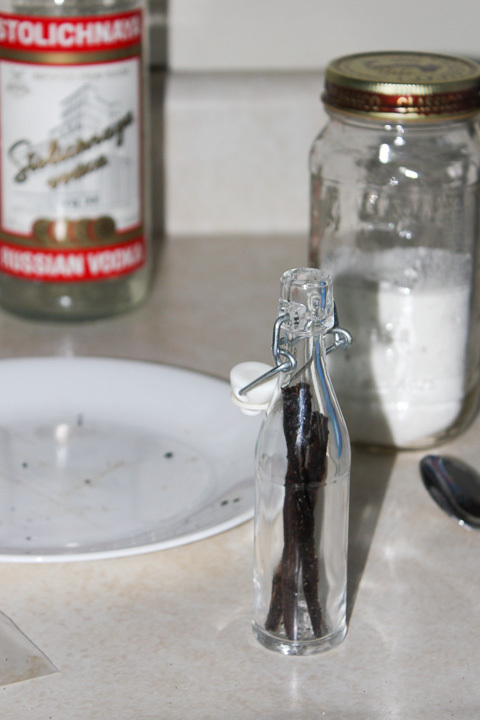 Hope you find this post useful and give making your own vanilla extract a try. As always, ask in the comments below if you have any questions.